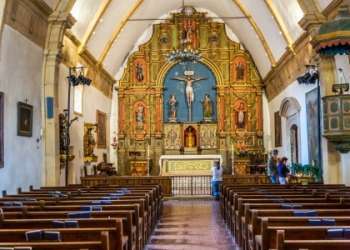 The crown jewel of the California missions, Mission San Antonio de Padua was founded by Fr. Junipero Serra in 1771 and, of all the missions, is the closest to the way it was during his life. It was the third of the 21 California missions and is still an active parish. There are picnic tables on the grounds of this secluded area and the ever-present garden blooms with roses in season. Mission hours are 10:00am-4:00pm. Located approximately 22 miles southwest of King City, take Jolon Road to Mission Road. For more information visit the official website.